The World Poker Tour is several hours away from ticking off yet another season in its fourteen-year history as completed. The popular poker brand has always concluded its Main Tour seasons in style and Season XV comes as no exception to this rule. This year’s Tournament of Champions will be completed tonight at Seminole Hard Rock and Casino Hollywood and six warriors will appear at the host venue’s poker arena to contend for the Season XV championship title, a first-place prize of $381,500, and additional prizes worth almost $150,000, including a brand-new 2018 Audi S5 Coupe. The six finalists are led by Daniel Weinman, who finished the tournament’s second day of play with 872,000 in chips, good for 87 big blinds. The player secured his seat into the event by winning the Borgata Winter Poker Open $3,300 WPT Main Event in late January. He outlasted a massive field of 1,312 entries to win the biggest chunk of the $4,199,712 prize pool, with that chunk totaling nearly $900,000. Weinman will be challenged by five seasoned poker players, some of whom sporting seven- and eight-figure live poker bankrolls. Michael Mizrachi closed Day 2 of the Tournament of Champions closest to the chip leader with a total of 699,000 in chips. The player is gearing up for his seventh-ever WPT final table. He has won two WPT Main Tour Main Events and is certainly eyeing a third title. Last year, the player made it to the final table of the Tournament of Champions and finished third. 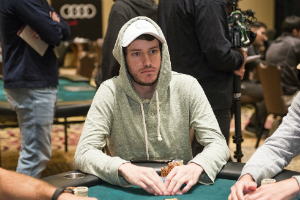 Dylan Wilkerson is the player set to begin Day 3 play third in chips with 641,000. He joined the WPT Champions Club in 2014, when he bested the field of the WPT Emperors Palace Poker Classic $3,500 Main Event in Johannesburg, South Africa, for $145,836. Poker legend Erik Seidel is entering the final table fourth in chips with a stack of 540,000. With live tournament earnings of $31,610,168, the player is occupying the second place in the all-time money list. Seidel has won eight WSOP gold bracelets and has cashed in a total of 270 different live poker events over the course of his career. He captured his WPT title back in 2008, when he won the WPT Foxwoods Poker Classic $10,000 Main Event for $992,890 in prize money. David Ormsby will start Day 3 competition fifth in chips with 299,000. The player prefers cash games action at Las Vegas’ Bellagio to live tournaments, but this did not prevent him from winning a WPT title last year. The player scooped C$383,407 for his first-place finish in the WPT Fallsview Poker Classic C$5,000 Main Event victory. Daniel Santoro rounds out the Tournament of Champions final table with 250,000 and as the short stack. Santoro won the WPT World Poker Finals $10,000 Championship Event at Foxwoods Resort Casino back in 2011 to collect his career’s largest cash of $449,910. The six Tournament of Champions finalists are set to return at the host venue for Day 3 play today at 4pm Florida time. Each of the players is guaranteed a minimum cash of $57,225, but it is more than clear that they are all striving for the title and the multiple accompanying prizes. Overall, the Season XV WPT Tournament of Champions was entered by 66 players and generated a prize pool of $1,090,000. The event featured a $15,000 buy-in fee and all Main Event winners over the course of the current season secured an automatic seat into the event.